The 2nd side of the Weight Loss Nation Triangle, is Moving Your Body! Your body “burns calories,” as you move and perform activities. Many of you have stated on my FB thread, that you LOVE to Dance! While in Orlando, I decided to stop into a nightclub that offers a high energy, fun way to sing, dance or even play a musical instrument if you want! I visited Howl At The Moon to see if I could “Live a Healthy Lifestyle,” while visiting a nightclub. I arrived on a Saturday night, around 11:00pm and International Drive in Orlando was hustling n’ bustling! A tall, strong man greeted me and my Podcaster friends with a smile, at the front entrance to Howl At The Moon. “Ten Dollar Cover Charge folks,” he stated. “What band is playing? I asked. “You haven’t been here before have you?” The bouncer asked with a slight grin. About five minutes later, a young man with a big smile came over and introduced himself as Paul Pronsati, the General Manager. I asked Mr. Pronsati if he would mind if I rated & reviewed Howl At The Moon for my podcast and Mr. Pronsati was happy to oblige. When you enter the premise, you better be ready to dance! There is a “U – Shaped” Bar as you enter the room. Tables and chairs are set up near the bar for those of you that aren’t dancing! Then……you see & hear the entertainment! On the left side the message reads……$24 Drink Tito’s …. on the right side reads…..$5 Go Eagles! I’m watching a large crowd singing and dancing and I decide to try out the message board. I walk up to side of the stage, where a table has pens and paper for you to sign up to have your message posted. 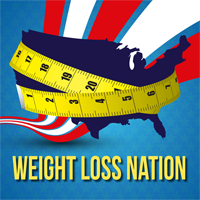 I jot down…… $6 Subscribe to The Weight Loss Nation Podcast. I hand the paper to one of the band members and he gives me an “affirmative nod,” and puts out an open hand. I hand him $6 in cash and he walks straight over to the right side of the mirror and “erases” ….Go Eagles….then promptly writes $6 Subscribe to The Weight Loss Nation Podcast on the mirror. How friggin cool! What was even cooler….is that my message stayed up on that mirror for about 20 minutes! As soon as the band finished playing…..I see a woman and man step up to the stage and the guy sits behind the drums and the woman takes one of the mics. The band plus the additional two members start to play a “Heart” song. Wow…..another cool concept. I felt like I was in a foreign country since I had no idea what was going on right before my eyes. The crowd LOVES it! People are singing and dancing to the amateurs singing and playing on the stage. I decide to join the crowd and BURN some calories by DANCING! I danced two straight songs that were awesome and then went to grab some water at the bar. I asked the bartender for a menu and he handed me one. I wanted to see if I could find any “healthy” items on the menu. The only thing was…..I only saw “drinks” on the menu. I asked the bartender if I could see the “food” menu and he says……”We don’t serve food here. It’s BYOF.” (Bring Your Own Food). I was like…..You have NO FOOD to eat here? I walked over to the “vending machine,” and it was filled with your typical “sugar n carb” snacks. What an education I received that night. I danced and sang along with the crowd. I can say with certainty, if you want to “burn calories” by dancing to good music, “Howling At The Moon,” is a great place to come and do just that. The “Drink” menu is quite large, and you will not be permitted to “bring in”any kind of drink. There are many creative drinks on the menu, but they are full of sugar…..so do your due diligence. They have a nice selection of lite beers and as for wine….you can choose a Barefoot Wine selection. That’s the only type of wine they have. For me and many of you…..water will be the drink of the evening. That’s a good thing…since you will be singing and dancing and need to rehydrate! Howl at the Moon gets a BIG “Two WLN Thumbs Up,” for being creative and allowing us Healthy people to bring our own food in. Burning calories by Dancing is awesome! Sunday thru Thursday they are open from 7:00pm till 2:00am. and they are open from 7:00pm till 2:00am on Saturdays. Howling At The Moon has “17” Locations across the U.S.
To check for a great evening of dancing near you! Thanks so much to Paul Pronsati, for putting up with me & my Podcaster buddies. It was an awesome experience and we would love to come back…I’m bringing my own dinner and I may sing or play the drums next time! Want to join Weight Loss Nation? Join the community of people who are just like you! WLN offers all the support and education you want and need to live a healthy lifestyle! Have a Happy, Peaceful and Healthy week!